As the sunlight faded completely, snow began to fall. It fell lightly at first, but as the night progressed, the clouds obscured the moon and the flakes fell in greater number. The darkness in the sky was absolute, but a dull, blue haze seemed to float over the white-covered ground. There was also a muted change to the normal sounds of the valley. Collins expected this of course, but he didn’t quite expect the extent of the silence. Still, on the balance of things Black Jack was happy for the change. Snow would conceal evidence of his trail. He wasn’t concerned about Coffee seeing that his trail was there (they obviously knew he was around), but he was concerned about them seeing where his trail on the pass ended. Furthermore, now that he and his horses had decent shelter, the snow was more of a concern to the men for whom he was lying in wait than it was for him. Plus, he was happy that when he woke from his now-frequent sleeps he could see if there was any disturbance of snow on the path below, while the lack of sound could be overcome by being deliberate in his watch. The benefits of the snow obviously outweighed the costs. He dozed on and off throughout the night. Every fifteen minutes or so, he would wake to check the snow into and out of his small part of the pass. And though he knew it was unlikely that he would hear anything, his ears remained pricked for odd shufflings, snow crunchings and the outside-of-the-wind creakings and grownings of trees and bushes. This sleep was not particularly restful, but it was cathartic. Black Jack knew that staying awake all night was impossible, exhausted as he was. But he also knew that it would drive him to the brink of insanity not to sleep. Though he had been alone with his thoughts for three days now, he had so far focused solely on his task – solely on the path, terrain and tasks in front of him. He wouldn’t allow himself to dwell on Emily for very long. That is, he wouldn’t allow himself to dwell on Emily except as was necessary to fuel the righteous anger anew and drive him forward toward the revenge he craved. He would only use that grief as a tool for him to focus his wrath. The pain of thinking about Emily as his wife, his friend and his love, surely would add to the heavy steel anvil-like lump of deadness in his stomach – something which he couldn’t bear. Instead, he could only think about her in non-absolute terms; only in the non-specific way that she was alive but isn’t now because of the murderous vengeance of a worthless criminal. He could only think of her in the same way he had thought of other victims of criminals he had chased in the past. Indeed this image of her, this lovely image of her as he knew her, seemed to do nothing less than take that anvil of deadness, hammer it out and then tie it – as it writhed furiously – into a knot. Several times that night Collins purposefully allowed himself to fall asleep just as he was getting close to acknowledging what the gnawing feeling was – allowing the sleep to distract him. He knew deep within the recesses of his mind that he couldn’t acknowledge Emily as his wife, friend and love … at least beyond the use of it for the re-ignition of his powerful engine of hate. Anything beyond that might derail his errand. Anything beyond that might make him reconsider. And so, he seemed to be caught between two minds: one a rabid and maniacal revenge-seeker which wanted action, no matter how rash; while the other was rational and patient and urged restraint. Black Jack had sided with the former, knowing it was the one that could deliver the justice he craved and which he thought Emily deserved. The latter, Black Jack had pushed down within himself; each time with greater force and more urgency. It was after one of those purposeful repressions that he woke, repeated his now-familiar scan of the valley and realized that morning had come. There was a slight orange tint to the sky as the first rays of sunlight began illuminating through the gray canopy the pass between the mountains. No sound or movement was out of place. Black Jack got stiffly to his feet and tread noiselessly back to the horses. They seemed warm and relatively happy, so he took a moment to pull out some feed and care for each of them in turn – checking the trail every ten minutes or so for movement. After caring for the horses, he went back to the perch and once again made his scan. He hadn’t thought too much yet about the timing of Butler’s progress through the pass. He assumed that they could be to his portion of the pass anytime this morning, but recognizing that this quick estimate would have taken several assumptions into account, Black Jack considered the timing in more depth. If Butler rode away from our ranch at about an hour after sunrise on the morning he killed Emily, they would have had a four hour start on me, Black Jack thought. He was fairly certain he had gotten ahead of the gang by about three hours with his ride over the southern mountain and he guessed that he had probably ridden his three horses fast enough to gain another two hours before he stopped for the night. In that case, Black Jack surmised, taking into account the long bend northward on the main trail, the earliest Butler could be here would be about two hours from now. Assuming they stopped for the night and slept ‘til sun up. This calculation could only be accurate if he had been fortunate enough for Butler not to have heard his shootout with Garza and Jenkins. But what if George slowed his ride through the pass enough to send a man or two up to investigate what happened to Garza and Jenkins? In that case it could be several hours later today … or even tomorrow before they arrive. Collins presumed though that the snow would decrease Butler’s speed and probably induce Coffee to plead with him to be even more wary moving forward. Another thought Collins had was if Butler found out that Garza and Jenkins had been killed, he would then obviously know that Collins was hunting him and that the pass through the mountains was now a very dangerous place. He would probably guess that Collins was ahead of him after the shortcut over the mountain, but he would also probably guess, despite Black Jack’s quick pursuit, that Black Jack had roused the small town’s people to come after him and his gang en posse … or, at the very least watch the eastern exit of the pass. 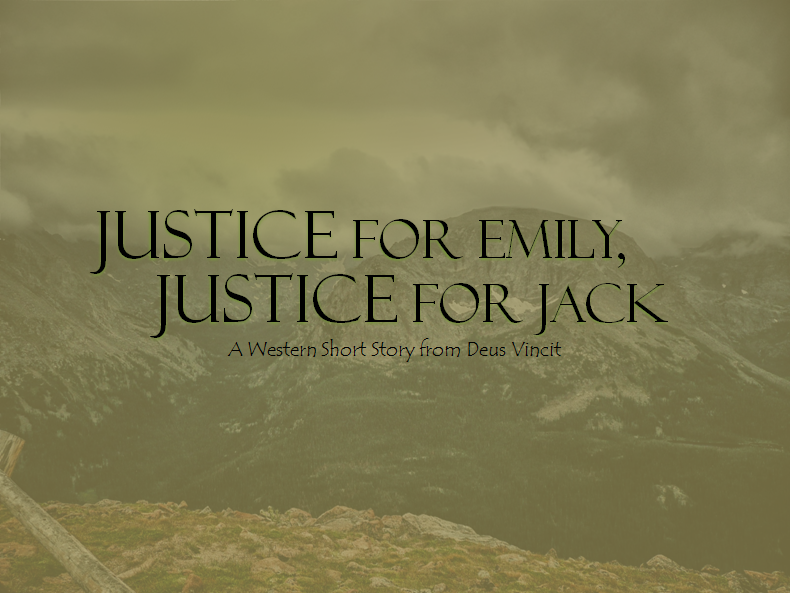 Which made Black Jack think that Butler would continue to move west through the pass – preferring to face one man over a posse, even if the one man was dangerously vengeful. Butler was a good gambler, Collins had seen that on their first meeting, but what George Butler probably wouldn’t have gambled on was the chance that a sufficiently vengeful Black Jack would not want a posse of law-abiding citizens anywhere near him for the justice he was about to serve. Butler had only known Collins as a Ranger, strong, capable and fierce, but dedicated to law and order. He couldn’t have foreseen the dormant rage he would rouse in Black Jack by any action … even the murder of his wife. It was the classic gambler’s mistake: underestimating the capacity of unpredictability in an opponent. With all of this mulled over, Black Jack knew that he had at least an hour to get certain preparations made, but it might be followed by a very long wait. He quickly grabbed his rifle and stepped down from the perch onto the slope surrounding it. Though the slope was very steep in front of the roost he had selected, behind it was only a mild incline for fifty feet or so before another steep rise. He used this flatter area to move east, paralleling the main path. Keeping his movements and tracks hidden from below by trees, boulders and outcroppings, he was able to see another quarter of a mile up the pass. Nothing stirred amid the trees except the occasional waft of wind which picked up some of the dry snow and blew it into hanging gray swirls. He had only been moving east for about ten minutes when he came to a sharp plunge from his elevation a hundred feet above the trail below. Realizing there was no way down, and no reason to look for one, he backtracked to his bivouac, content with the knowledge that no one was nearby and that no one could approach his perch from the south. But as he advanced toward his small overhang, he saw something from the fresh perspective which made his mind start whirring. Only ten feet below his perch, but partially obscured from it by the escarpment, a very large, fallen, pine tree lay precipitously on a massive boulder overhanging the trail below. It looked to Collins from this angle as if it was balanced so perfectly that the slightest breath of wind might dislodge it and send it hurtling down onto the path forty to fifty feet below. Climbing down to the fallen tree as carefully and surreptitiously as possible, Black Jack examined up close how it lay. All that held the mighty tree in place was a notch in the trunk where a branch had been broken off which gripped a sharp point on the rock. A slight adjustment in the equilibrium of friction between the two would dislodge the tree and send it back on its way down the slope. Hunting around nearby, Collins found another fallen tree; this one long and thin. He pulled his knife out and cut a long strip out of the smaller tree, creating a wedge on one end. With as much finesse as he could muster while wearing gloves, he inserted the wedged end between the tree and rock and then balanced the middle portion of the small tree on another rock he was able to move from the perch above. Examining his work as well as he was able from the limited points of view he had, he concluded that it was acceptable enough to work as he wanted. He was fairly certain that a tug on a piece of rope tied to the end of the fulcrum he had made would dislodge the large pine and send it crashing down onto the path below. He then thought the merits of the tree fall through carefully. Though it would immediately draw Butler’s attention to his approximate location, if Black Jack timed it right his quarry would be more concerned about staying out of the way of the massive tree than about the fire he would unleash on them immediately after. In addition, it would likely scare their horses and prevent them from immediately back-tracking out of the line of his fire. Now his mind switched to containing his quarry on the path to the east; he needed to find a way to pull his snare tight in that direction. The answer came to him in a flash. Walking back to the stand of trees where the horses waited patiently, he picked up Garza’s shotgun and Jenkins’ rifle. He made sure they were loaded and workable before placing them strategically in blinds moving diagonally northwestward and downhill from his main perch. When finished with this, there was nothing left to do but return to his perch and wait. He made a detour back to the trees to care for the horses, making sure they were fed and ready to move (if needed), where he then removed some food from one of the packs before beginning his vigil anew. All of the movement and work in the snow had left him wet, cold and hungry. He did his best to remove excess snow from his clothes before he wrapped his blankets tightly around himself and lay down in his small shelter in an attempt to stay out of the continuous wind blowing through the pass. An hour or so later, the snow began again. It further muted the sounds of the small valley and continued to blunt the sharp edges of wood, earth and stone. Collins fell back into his rhythm of shallow slumber interposed by careful search. At this point, he had been so long in this valley that he was certain he could tell when something was out of the ordinary. It was a sixth sense developed by men who spent time on the trail; honed by experience and by time in the natural quiet. It wasn’t just the slightest sound, movement or smell that would alert a sufficiently attentive man, it was something primal that had to be developed. Perhaps it was a genetic holdover from a more primitive time which had to have the openness of unexplored land and the loneliness of range to mature? Whatever it was, Black Jack’s time as a Ranger had refined this sixth sense into something on which he relied fully, though unconsciously. The snow stopped after about two hours and nothing else of note happened all of that morning. Black Jack got up from time to time to stretch his legs and care for the horses. The time waiting was only difficult to handle because he feared Butler backtracking out of the pass to the east. His desire for revenge was such that any amount of time waiting in cold and discomfort was dealt with easily, but the citadel of patience he built for this wait – buttressed by the cold need for vengeance – was undermined steadily by the fear that Butler wouldn’t show. His breaks became more frequent as his nerves began to fray. A certain amount of stress was welcome to Black Jack ahead of this standoff, but he began to sense that he was nearing the level of dangerous overload. He lay back down in his small shelter overlooking the pass and began consciously attempting to calm his brain, control his breathing and relax. However, it seemed that each increment of success he had in calming himself was met by increased thoughts of Emily. With the same urgency as before, Black Jack resisted thoughts of his lovely wife. Something subliminally refused to allow him to think of her … at least until justice had been served. Another subconscious part of him briefly wondered why, but was silenced as quickly as the thought came. The unwelcome incursion of such introspection seemed to reawaken his impatience anew and he flung himself up to a standing position once more and began pacing silently in the snow – out of sight of the pass. His nervous energy began to abate after a few dozen passes back and forth but his hands still felt jittery and shook slightly when he held them out in front of him. As he returned carefully to his perch to get his canteen he suddenly froze. Looking over the lip of his overhang, he saw a horse and rider turn the corner at the far eastern end of the pass. The rider whispered something over his shoulder and then got down and trudged silently a few steps forward in the snow. Black Jack’s shaking hands and jittery nerves immediately steadied at his suddenly taut mind’s command. He bent smoothly and silently down until flat and crawled to the edge of his overlook, grabbing his Winchester as he did so. As the man on the pass moved forward with snow-muted care, two other men came around the corner. The first man studied the ground, trees and surrounding terrain with a master’s air. He seemed to be testing the air, the sounds, even the feel of the place. This HAS to be Coffee, Black Jack thought. And THAT is George! Black Jack’s heart skipped a beat as a fourth man came around the bend into sight. At LAST, the remaining four men who had killed his wife were in his sights! Roast was inching forward, closer and closer to Black Jack’s snare. The older tracker was twenty feet ahead of the three other men, studying the terrain and motioning them forward at intervals. He seemed not to have noticed the small cliff on which Collins was situated and kept moving forward with the other three in tow. Perhaps the snow has disguised this cliff so that he can’t see me? Collins wondered to himself. This was the opportunity for which Black Jack had been waiting. All nervous energy he had experienced before now evaporated into a deadly and vindictive patience. He was a spider waiting patiently for a morsel to become ensnared in his web, a cougar willing his prey near enough to pounce. The silent wait continued as Coffee, still a little ahead of the other men, advanced. None of the other three men noticed the perch on which Black Jack waited either, and they all continued their advance. More than once a set of eyes skirted up the slope toward him, only to slide inattentively past. Coffee was now past the point on the trail at which Black Jack’s tree fall would land and Randy Aston, Brent Snyder and George Butler – Black Jack could see all of their faces now – were nearly to the spot. Collins’ entire body tensed. He sighted down the rifle barrel at Butler – his first bullet would be for him – and then gripped the rope to release his fallen tree. With a mighty pull, Black Jack released the dead timber and it threw up a massive cloud of dry snow as it crashed the final 45 feet down the mountain, throwing splintered bark and branches into the air and rending the silence of the pass with its thunderous lurch onto the trail. The sound and movement had only begun when Black Jack fired his first shot. It missed completely, but he worked the lever of his Winchester so fast that his second, third, fourth and fifth were already on their way before the confusion of the four men sprang to realization. Butler’s horse bolted and the big man threw himself over the only cover nearby: the now-stationary fallen tree. Black Jack saw – and savored for a moment – the look of recognition and terror as the other three men urged their frightened horses away from the tree only to be blocked in by hot, flying lead. Collins fired again and again. He saw Aston fall from his horse as one of his bullets struck home. The alarmed animal bucked the falling weight of the man off of him and tread hard on his body, crushing his ribs so loudly that Collins could hear it even through the muffled snow. Black Jack’s attention turned to Coffee who was trying to flank him on his left. He rapidly fired three shots into him as the older man ran for the tree behind which Collins had stashed the shotgun. As the old tracker dropped dead to the ground, Butler screamed at Snyder to get to cover and Black Jack jumped to his feet and ran down the small path through the snow which he had made to the next cover he had planned on using. Butler fired at him as he dove between two bushes and grabbed the second rifle. Collins then elbow-crawled behind a boulder before standing up and firing two quick shots into the gully on the north side of the path. The shots had merely been speculative as he assumed someone would attempt cover there, but he heard a yelp of pain in reply and saw Snyder clutching a red groove on his arm, drops of red staining the white snow beneath him, as he hunkered down further in the ditch. Butler began firing his own rifle back at Collins, yelling curses at him with every trigger pull. Black Jack fired back twice, but was mainly concerned with Snyder. The injured man would need to move soon if either he or Butler were going to get a clean shot on Collins. Butler began firing at Black Jack in quick succession and, guessing that Butler was laying cover fire for Snyder, Collins leaned around his cover quickly and fired the remaining shells from his second rifle over the lip of the ditch where Snyder sheltered, trying to hold him down. Collins threw the now empty second rifle to the side and sprinted to his third shelter. No shots pursued him as he slid through the snow behind two pines growing so close their trunks merged at the bottom. Coffee’s body lay motionless a few feet away, an expanding patch of pink snow underneath. He grabbed the loaded, double-barrel shotgun and spun around the western side of the tree, over the path and into the ditch on the other side. Snyder screamed in recognition as he saw Black Jack’s shotgun buck in his hands from a mere twenty feet away. The blast tore away at the gunman’s chest, and his shirt was immediately soaked in blood. For good measure, Collins’ unloaded the second barrel with equal effectiveness and pitched the smoking gun to the side. Butler realized that, for a moment, Black Jack’s attentions were on Snyder and sprang over the fallen tree, firing his pistol with deadly precision. Collins felt a tug of hot lead on his right shoulder and as the impact spun his body backward and down a second bullet struck him in his belly. A third grazed his cheek as he fell to the ground behind the berm which had sheltered Snyder. Rage all of a sudden coursed through every cell in Black Jack’s body. It renewed for a split second the energy sapped by bullets and loss of blood and cut through the paralysis of shock. His eyes and his head cleared for a nanosecond of time and his left hand flashed, quick as a viper strike to his gun. The pistol cleared leather, leveled on Butler’s chest and stabbed flame. Butler’s face went from triumph to incredulity to recognition as he felt death’s cold hand on him. He fired at Black Jack once, hitting him on the left thigh, as his body slumped to the ground. The sight of Butler’s body hitting the ground dissolved back into murkiness as snow, stone and sky merged into one. A watercolor mixture of detail smeared its way into his mind as he finally succumbed to the loss of blood. Suddenly everything went black. His final thought was of Emily. Her hands were outstretched to him, beckoning him to her arms. But on her face was a look of disappointment … not the love and sympathy he had expected. And then he knew no more.